Specs and Features Integrated tube headache rackOur headache racks are designed with the best and strongest materials to keep you safe when the unexpected happens. We don’t use our headache rack to house the hydraulic fluid, we use it to protect the most valuable asset on the truck-you!3" Steel roll-formed 3/16" channel cross members These are the toughest most durable subframe on work trucks. Integrated hydraulic pump system Our Pump system is integrated into the body making our squeeze bed one of the sleekest squeeze beds in the business. Furthermore, we don’t utilize the headache rack for fluid, its easily accessible in our recessed hydraulic fluid reservoir. Two doors easy access panels for hydraulics Let’s face it, hydraulic systems are going to need work. CM Truck Beds gives you the best access of any in the industry to work on your squeeze beds, hands down. Dual spinner for efficient feeding We didn’t design our bed to lift, we designed it to work. 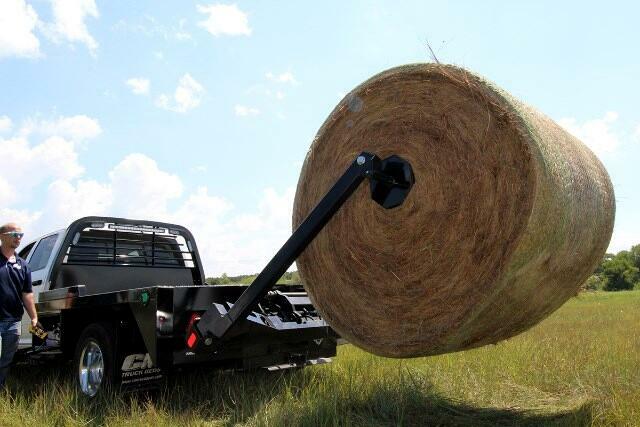 The SZ model gives you the ability to ride the ranch and feed while never leaving the comfort of the driver’s seat. 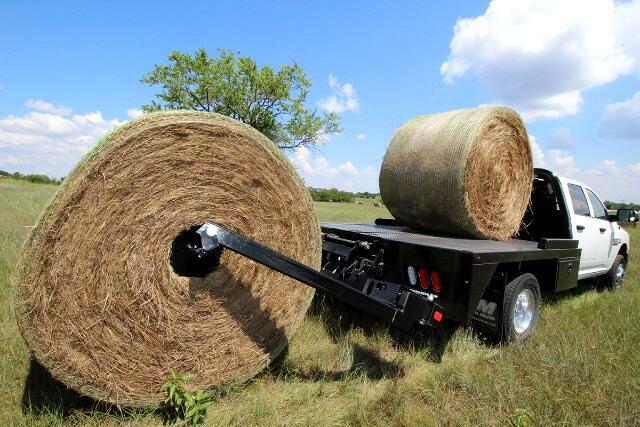 Our dual spinner system is easy to operate while allowing the hay to spin freely. Dual cylinder operation Many squeeze beds use just one cylinder, limiting lifting capacity and opening up the user to issues when cylinders or hydraulic systems fail. With the SZ model, you always have a backup. Furthermore, our lifting capacity is better than any in the business.Standard LED lighting Safety matters, and so does maintenance. At CM Truck Beds, we use LED lights on all of our bodies which are brighter and require less maintenance than any bed on the market today.1/8" steel tread plate deckThis strong and long-lasting deck is designed for heavy duty work, withstanding the rigorous work conditions that our bodies are placed under. Compare to other bodies on the market which use 11 gauge and 13 gauge floors.26,000 lb. rated B&W gooseneck hitch with 7 way electrical plugThis is a best in class, independently tested gooseneck hitch that will remain durable throughout your hauls, no matter what they may be. It also contains a 7 way electrical plug to give you ample choices for your power-driven needs.14,500 lb. rated B&W bumper pull hitch CM's independently rated bumper pull hitch gives you a best in class towing capacity which is integrated into the entire frame.Premium TGIC polyester powdercoat finish Super durable powdercoat finish CM Truck Beds coats our products with powder, while many other companies paint. Our powdercoat finish covers every crevice, under every edge, and with a protection to maintain a superior finish and shine for many years!4" structural steel channel frame rails Our structural 4" channel frame rails are stronger, more durable, and prevent any rusting from the interior of the tube. Furthermore, we don’t use roll formed runners, making our structure stronger than any on the market.7 way round and 5 way flat electrical plug standard on rear tailboardThis standard feature allows you to hook on to any trailer and provide quality results.2 – LED recessed tail, brake and back up lights mounted in headache rack Meaning CM's lights are brighter, and use less power than conventional incandescent lights, that way your stops, turns, tag lights and more will be easily seen and recognized.LED DOT required lighting (clearance and marker lights) Safety matters, and so does maintenance. At CM Truck Beds, we use LED lights on all of our bodies which are brighter and require less maintenance than any bed on the market today. When you are backing up, turning, or hitting those brakes along the road, our LED lights will make your truck bed stand out more and brighter! Our LED lights also use less power than conventional incandescent lights.Angled Fuel FillProvide a shiner, and better looking feature to your work truck. As well as a no-corrosion zone throughout your in-and-out hauls.Modular sealed wiring harnessOur wiring harness are designed to withstand the light or harsh conditions they are placed under. Our Modular Sealed Wiring Harness is designed to reduce corrosion, pulling apart, or deterioration. 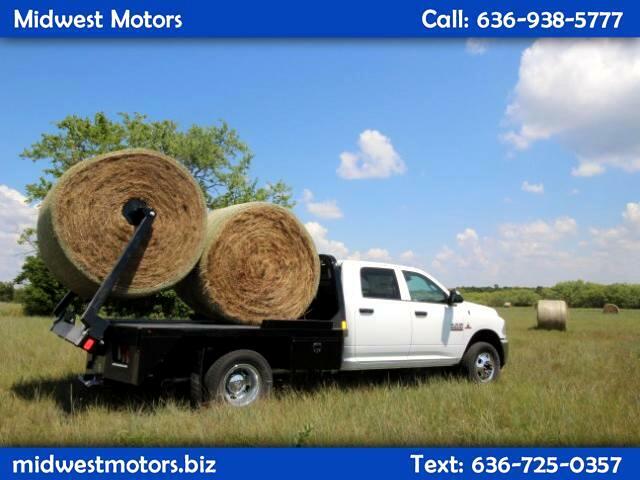 Call (636) 938-5777 or visit us online at http://www.midwestmotors.biz ! Midwest Motors in Eureka MO is West County's LARGEST Pre-Owned Full service dealership. Our secret? We treat people the way they want to be treated. Whether you're coming from St. Louis, West County, St. Charles, or Illinois, our sales, finance, and service departments are ready to help you become a lifelong customer! We look forward to serving you! We also carry service beds, utility beds, flat beds, service bodies, CM truck beds, and more! Message: Thought you might be interested in this 2019 CM SZ. See Dealer Staff For All Details.